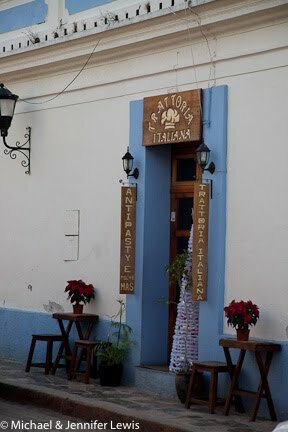 The choices of Italian restaurants in San Cristóbal are a little overwhelming. They are only exceeded by the number of Mexican places, with Argentine parillas taking a close second. We didn’t eat in all of them, but we had one of our best Italian meals in memory at Trattoria Italiana. The small place exudes warmth, both in ambiance and in the personality of the mother and daughter who do the cooking and serving. 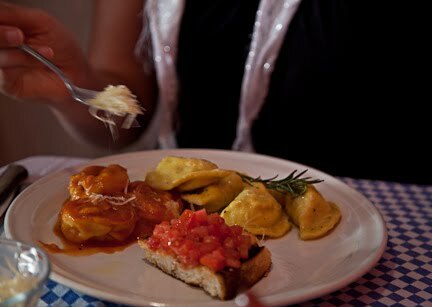 From Northern Italy, they put together a daily menu that makes you feel like you are in Italy. Vitello tonnato, bruschetta, five kinds of ravioli, rabbit, menu items with porcini. Got it? The menu is recited in English, Italian or Spanish. We go for the bruschetta, wonderful slices of bread with ripe tomatoes and perfect olive oil. 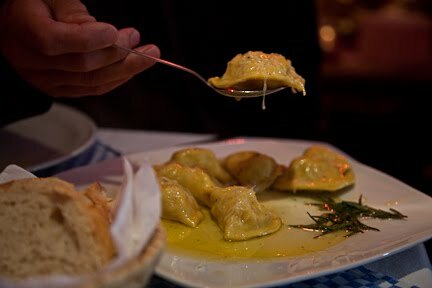 We settled on the salmon ravioli with a butter, olive oil and rosemary sauce. The quattro formaggi and arugula raviolis were in a tomato sauce that was light and rich at the same time. A couple of glasses of Spanish cabernet later, we waddled out the door, both saying aloud, “Wow, wish we had leftovers”.